PlayStation 4 Pro (capacità HDD 1TB) × 1. Platform Sony PlayStation 4. Hard Drive Capacity 1TB. Inoltre, 1 TB di disco rigido è montato di serie, così che si può godere più titoli, versioni di prova, contenuti aggiuntivi, filmati di gioco e altro ancora. PlayStation 4 Pro KINGDOM HEARTS III LIMITED EDITION. Console PlayStation 4 Pro (HDD 1TB) × 1 ※ design originale. Hard Drive Capacity 1TB. Platform PlayStation 4 Pro. Condizione: Nuovo. Set completo di materiale stampato. 4,5 su 5 stelle - SONY PlayStation 4 ,PS4, PRO GAMMA da 1TB Black Pro Chassis . 4 valutazioni prodotto4 valutazioni prodotto - SONY PlayStation 4 ,PS4, PRO GAMMA da 1TB Black Pro Chassis . 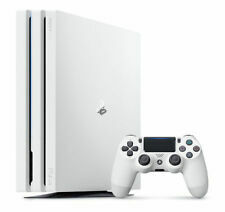 Boxed and near mint PS4 Pro White 1TB console. Been used a handful of times. Comes with white official controller, hdmi, power lead. Sony PlayStation 4 Pro 1TB Console - Black. Condition is New. Dispatched with Next Day tracked Courier Service. Erkunde fantastische neue Welten, erlebe unglaubliche Abenteuer und werde zur Legende. So wird zum Beispiel dank der Auflösung in 4K-Qualität auch das kleinste Detail angezeigt. 1 Netzkabel für Deutschland (CEE 7/4 Stecker F). FORNITE LOTE DE CRIOGENIZACION. Eleva la potencia. Junto con los vibrantes y asombrosos colores con tecnología HDR, tus aventuras cobrarán vida con una viveza increíble. Disco duro de 1TB. GRAN TURISMO GT SPORT X1. JetBlack, CUH-7216B. Breite: 295 mm x Höhe: 55 mm x Tiefe/Länge: 327 mm. Sony PlayStation 4. HDMI: 1, RJ-45: 1, USB-A: 3, Digital-Out (optisch): 1. WLAN, Bluetooth. x86-64 AMD "Jaguar", 8 cores. Sony PLAYSTATION 4 Pro 1tb NERO!!! firmware 5.05 Hen OTTIMO STATO!!! Ich wünsche viel Freude mit der Konsole. Diese ist voll funktionstüchtig und weist einen top Zustand auf. Der riesige Festplattenspeicher erlaubt das Installieren von enorm vielen Spielen, ohne Kompromisse. The external box is torn little bit. Sony PlayStation PS4 Pro 1TB Jet Black Console and Power cable Only - Original. Condition is mint. Refurbished exchanged unit from SONY Firmware 5.55 GAMMA Model Comes in in plain box with Matching barcodes. 1 x official controller included Genuine buyers only. No scammers or time wasters. Serial number logged for mutual protection. Incluye 2 mandos Dualshock. Nombre del producto : PlayStation®4 Pro. Capacidad de almacenamiento: 1 TB. Salida HDMI (compatible con 4K/HDR). Temperatura de funcionamiento: 5 ºC - 35 ºC. Consumo de energía: Máx. Sony PlayStation 4 Pro - 1TB Jet Black. Sony Playstation 4 Pro Konsole, 1TB, schwarz. - 24 Monate. - Spiel Red Dead Redemption II. Viel Spass damit. aktuellstes Modell CUH-7216B, 1TB, SCHWARZ. Sony Playstation 4 PRO. Produkttyp Spielekonsole. Anschlüsse 3x SuperSpeed-USB (USB 3.1 Gen 1), 1x HDMI-Out, 1x optischer Digitalausgang, 1x Gigabit-LAN, 1x AUX. Tiefe 327 mm. Altersfreigabe (USK) Freigegeben ohne Altersbeschränkung. Es handelt sich um die französische Version mit französischem Cover und Bedienungsanleitung. Die Konsole kann problemlos auf deutsch betrieben werden. PlayStation 4 Pro - Konsole (1TB). Doppelt so viel Power durch die unglaubliche Kombination von visuellen Eigenschaften und Performance in einer Konsole. JUEGO 1 MANDO EDICION LIMITADA. Es el mando para PlayStation más ergonómico e intuitivo que jamás hayamos diseñado. Disco duro de 1TB. PlayStation®4Slim. Sistema PlayStation®4. Conéctate con tus amigos: Crea grupos, chatea con los amigos o únete a comunidades de juego para buscar nuevos jugadores. Die Konsole ist unbespielt, das Spiel ist verschweißt. Vai oltre 1080p con la console di gioco Sony PlayStation 4 Pro. Siamo felici di farti sapere che siamo tornati dalle vacanze di Pasqua! Cancellation Request within 24 hours Self-pick up service will not be provided. PlayStation 4 Pro - Konsole( 1TB, schwarz) inkl. 4K - Wenn Sie auf einem 4K Fernseher spielen, profitieren Red Dead Red Redemption 2 Spieler von einer höheren Auflösung. HDR-kompatibel - Spieler mit HDR-Displays können das Spiel in High-Dynamic Range Color (HDR) erleben. Capacidad: 1Tb. Playstation 4 PRO de1Tb Negra última versión. Conéctate con tus amigos entre consolas PlayStation 4 Pro y PlayStation®4 y engánchate a la mayor comunidad de jugadores online con PlayStation Plus4. (1 x Netzkabel 220V 8Stromanschluss). 1x Playstation 4 Pro - Konsole 1TB schwarz (Modellbezeichnung: CUH 7116B). 1 x HDMI Kabel (Monitor-/Fernseheranschluss). Profitieren Sie von der Erfahrung und Qualität eines Fachhändlers, wir kennen uns aus. PLAYSTATION 4 PRO 1TB. In addition to the standard ports, the Pro features a few that will aid advanced gaming. For example, it's fitted with an HDMI 2.0 port to let it output at 4K resolutions. Even more interesting is that it's built with an extra USB 3.0 port, which is perfect for linking a PlayStation VR. Condition is New. 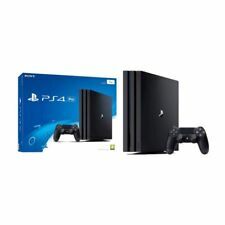 Sony PlayStation 4 Pro 1TB FIFA 19 Console Bundle - Jet Black. Unbenutzte Konsole. Ihren Spam Ordner. Durch die Einsparung von Verbrauchsmaterialien wie Papier und Tinte/Toner werden wertvolle Umweltressourcen geschont. Sony Playstation 4 Pro. It looks better, runs smoother and is one of the most powerful consoles out there. Be a part of the new and improved console brought to you by Sony. This item is fully tested & working. PlayStation 4 Pro 1TB Konsole. (siehe Foto). Conditions / Zustand : Neu & OVP (ungeöffnet, versiegelt, Sammlerobjekt) - new & sealed. Tierfreier- Nichtraucherhaushalt! Alle genannten Wort- u. Bild-Marken sind geschützt. SONY PlayStation 4 Pro 1TB Limited Ed. Features & Specification: Disc format: BluRay. High quality player and disc quality. Supported services: PlayStation Now, PlayStation Network / Plus, Wi-Fi, Bluetooth. Playstation 4 Pro 1TB White. RED DEAD REDEMPTION 2 BUNDLE. PlayStation 4 Pro (capacità HDD 1TB) × 1. Hard Drive Capacity 1TB. Platform Sony PlayStation 4. Inoltre, 1 TB di disco rigido è montato di serie, così che si può godere più titoli, versioni di prova, contenuti aggiuntivi, filmati di gioco e altro ancora. A Blu-ray Disc™ copy of FIFA 19. Three FIFA Ultimate Team™ ICON loan players on a five-match loan period. Release date: 28 Sep 2018.